Today is the start of a fun install in our home! We decided to hire someone to install hardwood floors in our upstairs hallway and stair landing. 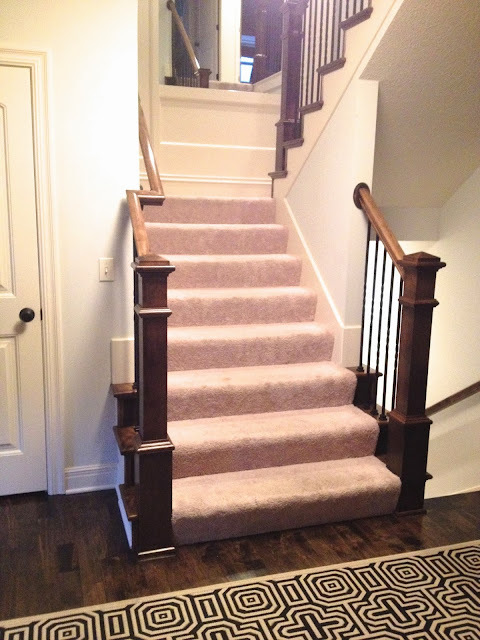 After the floors are installed/sanded/stained/sealed, they will come back through and finish off with a stair carpet runner on the stairs. This is something we debated doing before we moved in. At that time, things kept adding up, so we decided to hold off and change it down the road. Well, today is down the road and I am so excited! Please excuse the terrible iPhone photos in bad lighting, but you get the idea! The hardwoods are going to be the exact same wood (rustic maple) and stain as the downstairs. I debated going a little lighter since dark hardwoods show EVERYTHING, but ultimately decided to just keep it cohesive. I think this landing will look so much better with a dark floor to break up the light wall color and the light trim. The huge mirror helps to bounce light around since our stairwell interior, with no windows. The wood and railings will remain the same. The carpet we chose is light in color, very durable, and has a slight diamond pattern to it. Once it is installed, I will have more pictures. This is a shot of our upstairs hallway, which will be all hardwoods. Can you believe we have lived here for almost two years and not one thing has been hung in this hallway?! Once the floors are done, I am going to do some touch up painting and get to work on it! Again, I think the white trim and doors will look a million times better with a dark hardwood floor below. I like to DIY small projects, but this is best left to the professionals! 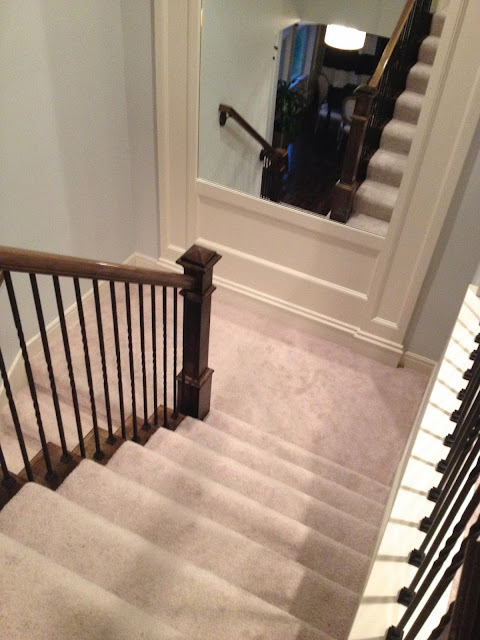 We decided to get two quotes for this project, and ultimately decided to go with the company our builder uses for new homes, and who installed our floors downstairs, which we have been extremely happy with. Today is the carpet rip out and installation, Friday is sanding and staining, and first two coats of sealer. Saturday is the final coat of sealer. The first two coats will be water based, and the third will be a hard coating oil based seal for maximum durability. I see lots of sock sliding kids in my near future! The next debate will be to add a runner or leave it open?? Thoughts?? 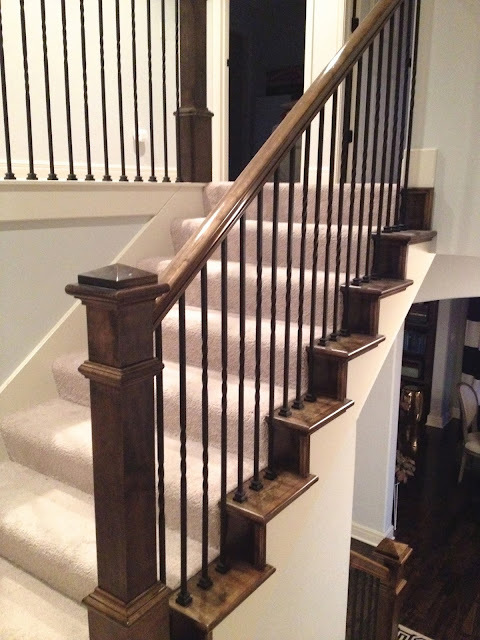 We had hardwood installed on both of our landings and we loved it way more than we even expected. 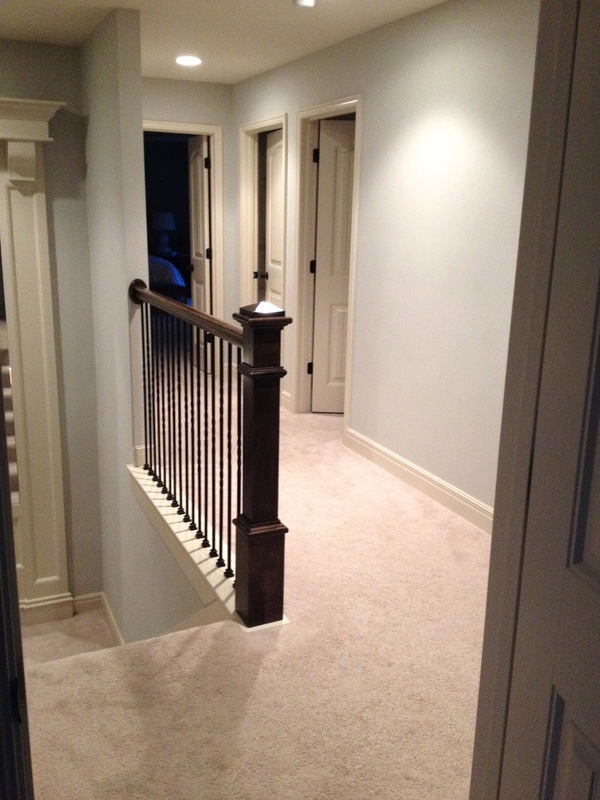 I would love to do our upstairs hallways eventually as well. Carpet weirds me out :) Can't wait to see how it turns out! If I had it my way, the whole house would be hardwoods! I think it will make such a big difference, I can't wait until they are done!